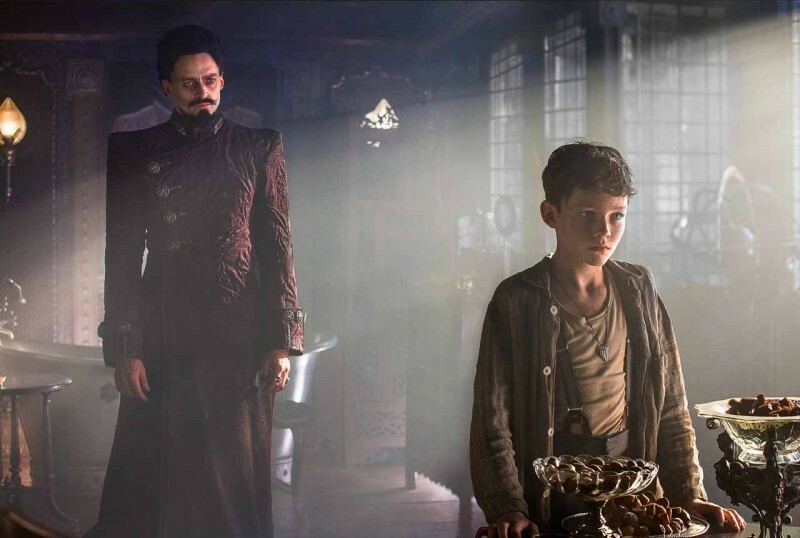 PAN OPENS IN MALAYSIA ON THE 8th OF OCTOBER FOR EVERYWHERE ELSE FIND OUT HERE. So a movie about the origins of Peter Pan and his nemesis Captain Hook. I honestly don't remember there being much of a buzz about audiences anywhere asking for this story to be made, I'm sure people were curious about his backstory but asking for a full length feature film about him? 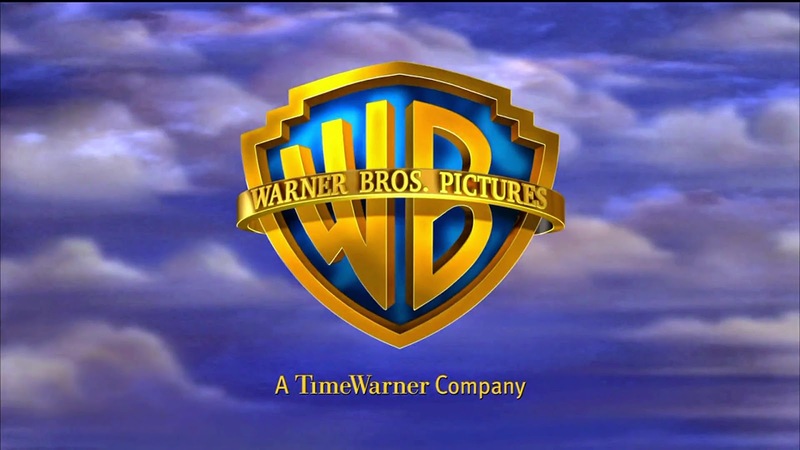 Anyway, according to the Wikipedia page for it the script or treatment for Pan was on the Hollywood's 2013 Black List, it's basically a compiled list of scripts that although were liked by producers and directors were for whatever reason not liked well enough to go into production at the time. The story of the Hollywood Black List is actually quite interesting on its own because although we usually associate bad things with the term Black List some of Hollywood's most successful and acclaimed movies had scripts that were listed on the Black List. 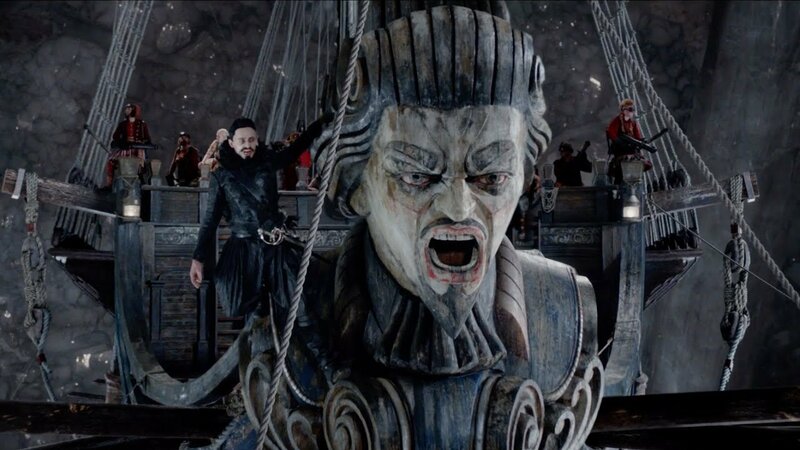 Well now that it's in the cinemas we know that the Pan script eventually got off the Black List. But the Black List was not the only problem that Pan has had to encounter, when the film was being cast and the role of Tiger Lily came up not everyone was happy with the choice that the producers and directors made. The role of Tiger Lily in the books and even in Disney's animated Peter Pan was of a Native American descent so when certain folks heard that Rooney Mara was cast for the role not everyone was happy. 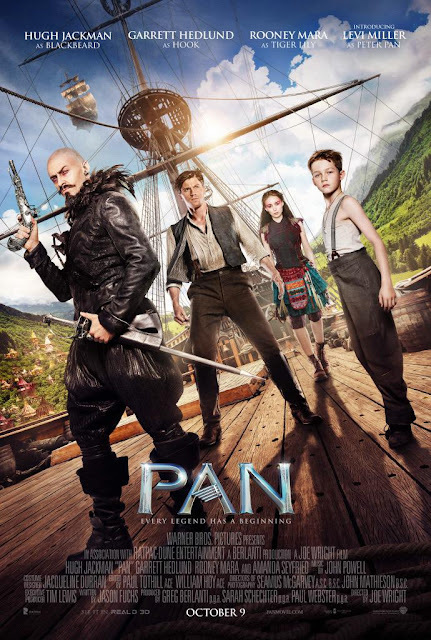 Critics generally found a problem with how the film was cast and surmised that the reason for the studio and film makers casting decision was probably because they wanted to avoid repeating the racism of previous Peter Pan stories by altering the ethnicity of the Piccaninnies rather than using the stereotypical portrayal of the source material. HERE'S WHERE I RECAP WHAT I JUST SAW WHICH MEANS THERE BE SPOILERS AHEAD ARRRR!!!! Back to the film, Pan traces the story of the boy who never grows up from the moment his mother abandons him at the doorstep of the Lambeth Orphanage for Boys about a dozen years before London experiences regular air raids and bombings courtesy of Hitler's Luftwaffe and Junker bombers. Then we skip right up to when he's twelve and lives with other orphaned boys at Lambeth where he wakes up, washes up and has porridge without bacon as England is currently on rations due to WWII. The orphanage looks like something out of Oliver Twist and Peter (Levi Miller) even sort of looks like him. They are looked after by nuns and wouldn't you know it the head nun is a crabby and cruel woman who walks around with a huge stick and is actually keeping all the food rations to herself in a hidden room. Of course Peter being Peter and his friend Nibsy (Lewis MacDougall) suspect that Mother Barnabas (Kathy Burke) is hiding the rations and one fine night they go looking for it. They find it of course as well as the records of all the boys in the orphanage including those that have left. Nibsy even finds Peter's file and shows it to him. Peter finds a letter from his mother inside but unfortunately he has dyslexia or something and has Nibsy read it to him. Just as Nibsy gets to the end of the letter the Germans arrive and bomb the city including the orphanage and wouldn't you know it the bomb lands with such precision that it exposes the boys in the hidden room and Mother Barnabas is standing right there to find them both. They get spanked in the hand with a pine ruler. Later that evening Peter and Nibs get to discussing what they've found and about how come so many boys leave the orphanage lately. Nibs suggests that maybe Mother Barnabas is selling them to someone. Peter hatches a plan to catch Mother Barnabas doing just that that same night. That night they stuff pillows under their blankets and hide in the lockers that line one side of their dormitory but soon they tire of waiting and head back to bed but just as they begin to doze off boys get snatched out of their beds by pirates that drop through the skylight. Peter and Nibs try to escape but are caught. But onboard somehow Peter and Nibs are the only ones not chained and they make their escape. Nibs manages to jump over the side and land on the roof of the orphanage but Peter doesn't, he's too scared to jump. So a chase ensues as the pirates try to capture Peter and put him back in the hold but at the same time the RAF on patrol spot the flying pirate ship and begin the shoot at it which ends up in the oddest aerial dogfight you could imagine. The pirates escape of course by going up higher than the Spitfires can fly and when they reach space Peter begins to float away but lucky for him during the ships escape from the Spitfires he wrapped a rope around his leg. Once clear of the Spitfires the ship which is of course called the Jolly Roger heads back towards Neverland with its cargo of boys. When the ship finally stops it's over a huge hole in the ground and they await the appearance of Blackbeard (Hugh Jackman) which for some reason happens when everyone working in the hole in the ground, which turns out to be a mining operation, begins to sing in unison Nirvana's Smells Like Teen Spirit which sounds like it has been composed for a stage musical. Blackbeard of course shows up and sings along of course. At the end of the song there's a speech and then rules for being part of his team. Later Peter finds himself in the mines looking for something called Pixum which no one can explain to him what for including Sam Smiegel or Smee as he likes to be called (Adeel Akhtar) who is some sort of supervisor for Peter's area. He also meets with Hook (Garrett Hedlund) a man who's been at the mines so long he can't remember where he came from. So that's his first day at the mines and it ends with him finding no Pixum, learning nothing about Pixum or what it's for and meeting people who will be important in the next few scenes. Also Hook gives him a lesson on proper pick axe maintenance and that Peter shouldn't consider him a friend or ever rely on him. The next day while not really trying all that hard at mining he finds a very large piece of Pixum which is immediately taken from him. When he tries to get it back the robber claims he found it and that Peter's a liar which gets him a one way express ticket to meet Blackbeard because Blackbeard doesn't look kindly upon such behavior. Up on Blackbeard's ship the planks have been laid out off the sides of the ship and Blackbeard gives a little speech before the days criminals including Peter are led to the edge of the plank. Blackbeard announces their crimes and then petitions the watching crowd of adult and minor miners what their punishment should be, of course everyone screams for them to walk off the plank to which Blackbeard complies by bouncing them off it. When he reaches Peter the punishment is of course the same but instead of bouncing him off the plank he gives him a back kick. Peter falls but not all the way when he suddenly begins to float then loses his ability to float and falls flat on his face knocking him out. Just before Blackbeard kicks him he tells Peter to have 'happy thoughts'. When Peter regains consciousness he's lying in bed in Blackbeard's room and to the voice of Blackbeard. Blackbeard tells him of the prophecy of a boy who flies that is supposed to defeat him and asks Peter if he's brave enough to kill him, then he sends Peter to prison. In prison Peter doesn't have to wait long when conveniently Hook has found himself a reason to be sent to prison as well and to the cell next to Peter's. Hook makes Peter an offer he can't refuse and tells him there's a bomb right by the door that's set to go off in 30 seconds. Peter refuses at first unless Hook agrees to his terms. The bomb goes off and they escape. On their way out the enlist the help of Smee to help them get out of the mines and onto the elevators which will take them to the cable car trolleys which will then take them to the air ports and onto one of the flying ships. Or so that's the plan until Peter hears his part in it which is since the ships aren't docked close to the ports for fear of being stolen Peter has to fly onto one of the ships and get it close to the port so that the others can get on. Before any of that can happen there's a fight and in the fight they don't knock or throw everyone to their death and when one of the pirates recovers he pulls the lever to bring the trolley back to the elevator platform. Peter gets a brilliant idea to cut the cable. The trolley swings wildly away but conveniently swings over a ship crashing into its sail and everyone comes crashing onto the deck of the ship. They make their escape on the ship they just crashed on with Blackbeard's men breathing down their neck. They escape of course when Blackbeard's men fire a cannon that brings down their sails and they go crashing down towards Neverland's jungle below. Back on the jungle floor and near the wreckage while Hook complains Peter who's been on a flying ship only twice in his life goes in search of a map which he is sure every ship must have. He's looking for the location of the tribes that Blackbeard has been at war with and the place where he can find out more about himself, his mother and all the flying nonsense. So they trek through the jungle in the direction the map says to go. When they stop for the night they are attacked by very large zombie birds with pretty feathers. The attack ends when they are saved by the very people from the tribe they are looking for, the Piccaninnies although they're not called that in this film. Hook tries to tell them about Peter but nobody's listening. Back at the tribes village which sort of looks like the Ewoks village Hook is given a challenge, defeat the tribes hero and he and his friends will be set free, lose and everyone life ends. So Hook fights the tribe's hero who looks like a Shaolin monk with bodypaint on a trampoline arena. As Hook gets bounced around and beaten, Peter works on his straps and just as it seems Hook is losing Peter jumps into the fight but as he does so his necklace, the only keepsake he has from his mother, is snagged on something and drops at the foot of the tribe's chief who upon seeing it orders the fight to stop. 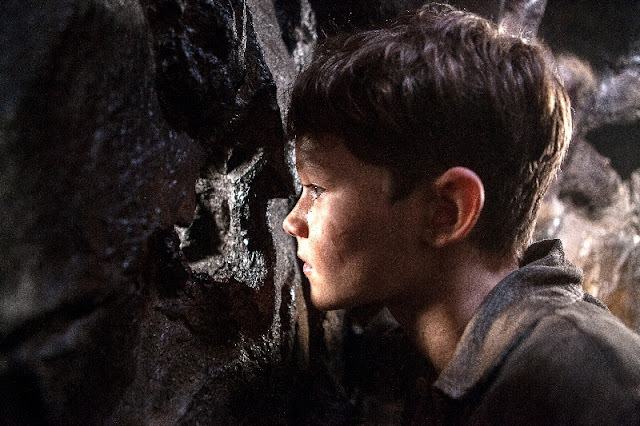 The charm on his necklace which is a small metal pan flute marks him as one of their own and when Hook tells them about how Peter can fly the chief passes a decree, in three days Peter must fly and if he does he is the boy in the prophecy and one of them but if he doesn't they all die. But before the third day arrives Blackbeard arrives at the village after bumping into Smee in the middle of the jungle. 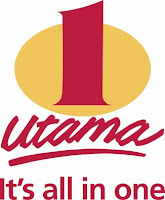 They attack the village and kill the Piccaninnies who explode into colorful smoke when shot at. When Blackbeard finally manages to get his hands on Hook, Tiger Lily and the Chief he demands they tell him where the secret home of the fairies are. When the Chief refuses he explodes into colorful dust. 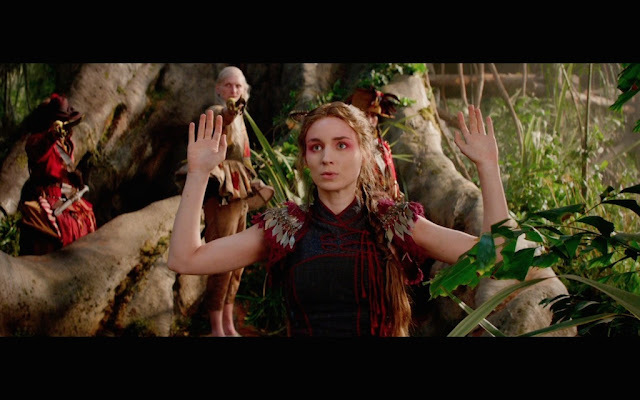 Next he threatens Tiger Lily (Rooney Mara) but when she refuses Hook worried that Blackbeard will turn her into colorful dust spills the beans. Just then Peter who managed to escape Blackbeard's clutches comes back to the rescue riding one of those Neverland zombie birds with a flock of them following behind him. As chaos ensues when the birds crash Blackbeard's party Hook and Tiger Lily escape but Peter unfortunately falls of the bird he's riding. As Peter tries to find a hiding place Blackbeard discovers him and circles him like a predator. But all is not lost of course as just as Blackbeard is about to skewer Peter with his cutlass Hook pulls him up to safety. Now that the team are back together again they make their way to the fairies secret home. Meanwhile Blackbeard ransacks the tribe's village looking for the map that leads to the fairies secret home. Peter, Hook and Tiger Lily's journey takes them onto a river and as they drift lazily she offhandedly tells Hook that the calm waters below hide crocodiles. And not long after she mentions that that a crocodile begins to circle their raft. Tiger Lily tells them to light torches and wave them around because they lights scare the crocodile away. It doesn't seem to work though as it gets closer, jumps over the raft and then returns to rock their raft causing Peter to fall over and into the water. In the water Peter is dragged ever deeper when the crocodile pulls him down by his suspenders. But fear not as just then mermaids show up to save him and not just any mermaids but triplets. They scare the croc off with their bioluminescence and bring Peter back to the raft and then help guide the raft to shore. Safe on shore Hook spots the wreck of a ship and decides to swim out to it to check it out to see if it can be salvaged. Where the croc has disappeared to no one knows. Meanwhile to assuage Peter of his fears and of course his anger and finding out that he's not been told the whole truth by not only Blackbeard but by Tiger Lily as well, Tiger Lily tells him that the waters where the mermaids call home and where they just came out of is charged with memories by the mermaids and that by taking a dip in it it'll show him the truth. Apparently swimming in it just now and almost drowning in it earlier isn't the same. The underwater visions Peter has tell him the whole story of how his mother died and the relationship between his mother and Blackbeard. When Hook returns he tells them to follow him back to the ship. At the ship he tells them that it can be repaired and ready to fly by morning. Tiger Lily refuses to go with them. Morning comes and as Tiger Lily watches the ship disappear into the distance Peter shows up and tells her that regardless of the prophecy he'll follow her to find out what's what. The duo eventually reach the spot that would tell them where the fairies secret home is and what they find instead is a wall in a cave with scribbles written in concentric circles. Tiger Lily believes it may be fairy language and surprise surprise it turns out that his dyslexia like problem is a means to decipher fairy script. The writings on the wall talk about how a chosen one will come and he will be the key and then rambles on about a war. Unbeknownst to the duo they've been followed by Blackbeard and his crew and as they mull over what they've just read Blackbeard makes himself known to them and points out the obvious, the pan flute on Peter the chosen one's necklace is the key to unlocking the doorway. So Blackbeard snatches the pan flute off Peter's neck and puts it into the tiny holes that the both of them were just looking at. Lo and behold the wall dissolves and before them the home of the fairies which is a huge Pixum crystal cave. Back on board Blackbeard's gallion Tiger Lily and Peter are strung up and they make their way into the cave and towards the center of it where the fairies are. Blackbeard is ecstatic at seeing all the Pixum. Now that they're in the cave Blackbeard orders his crew to burn all the fairies they encounter. As they make their way a fairy flies up to Peter and begins to talk to him, the fairy tells him her name is Tinkerbell. As he tells Tinkerbell to run Blackbeard appears and cuts off the rope that hangs Peter by his hands and orders him to kneel before him. Peter in a sudden moment of courage tells him that the son of a warrior and a fairy prince does not kneel. Right then Hook shows up and rams into Blackbeard's gallion freeing Tiger Lily from her ropes. Now free she fights Blackbeard. The fight lasts a while and Hook periodically rams into Blackbeard's ship. Peter jumps from Blackbeard's ship onto Hooks but when he notices Tiger Lily in trouble he tries to help by jumping back onto Blackbeard's ship. Hook notices this too but unfortunately has his hands full when Blackbeard's right hand man Bishop (Nonso Anozie) jumps aboard and wants to have a word with him using his fists. As Hook and Bishop fight the ship they're on flies wildly and crashes into the huge Pixum crystals that jut out of the walls, floor and ceiling of the cave like gods angry fingers. The ship finally crashes into one too many crystal pillars and as it grinds on the surface of one it slips right off the edge of it sending Bishop first over the edge and the Hook. Peter sees all this and though Blackbeard mocks his ability to fly down to save them he ignores Blackbeard and jumps down diving towards Hook to save him. Of course Peter does suddenly know how to fly and he picks up Hook and drops him off on a nearby Pixum platform. Then he gathers all the fairies to him and orders them to swarm the pirates and Blackbeard and beat the living lights out of them. The pirates are all thrown overboard to their deaths while Blackbeard is beaten mercilessly by flying lights and since there's no one piloting the ship it crashes bow first into a crystal wall sending both the ship and Blackbeard on it to his death. With Blackbeard defeated the trio return to the tribe's village with fairies in tow. Peter returns to the orphanage now wearing his familiar hat with the feather to save Nibs and the other orphans. Hook hooks up with Tiger Lily and is now Captain Hook but since he hasn't lost his hand yet he's still a nice guy, sort of. 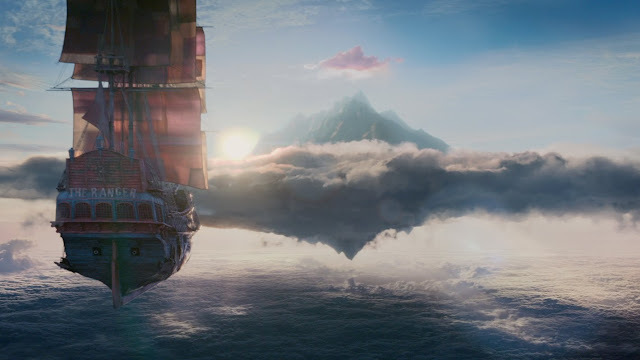 Let me explain what I'm trying to say up there, when I first saw the trailer it seemed to me that it would be a fun movie, it had flying pirate ships, Neverland looked amazing and Hugh Jackman was a pirate. I thought what could go wrong but then I saw bits of Levi Miller's performance and something about it turned me off a little, had me thinking this might not turn out so well. My suspicions weren't wrong. He's not very good. His reactions and facial expressions seem a little stiff and at times unnatural and forced. It felt like I was watching an actor who should be in a school play instead of someone who is in a movie. I had just seen Milo Parker in Mr Holmes and Milo is so much more better and he had to act with Sir Ian Mckellen. His expressions, reactions and delivery seemed to me too amateurish, he looks good for the role but his abilities as a thespian leaves much to be desired. But Levi is not the only one whose performance I was disappointed with, the other honor goes to Garrett Hedlund. 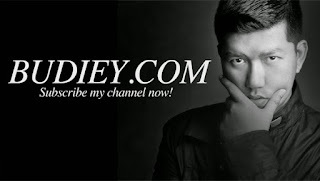 The problem with him is both his acting and his accent. His performance felt awkward and his accent seems to be from nowhere. 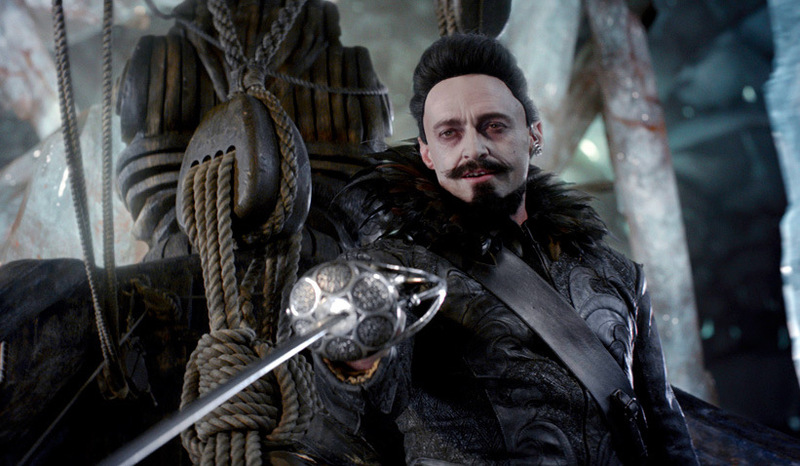 I know he's supposed to be Captain Hook but right now I don't know who he is. And what is the deal of dressing him to look like Indiana Jones or maybe that's just me. The only entertaining performance was from Hugh Jackman whom I think just had fun with his character. Playing the over the top and flamboyant Blackbeard he certainly looked like he had fun. And when he was evil he certainly looked it. The other actor that did a pretty good job is Rooney Mara, sure the role should have gone to a Native American actress but she didn't do a bad job at her role. And a good word must be put in for Adeel Akhtar who plays Smee, he was very entertaining and the only one who got a laugh I believe. But the faults don't just stop at those two actors, there's the dialogue which is just so full of clichés it was ridiculous. You knew what they were going to say at a given scene just before they said it. That being said the story is a little too predictable as well, I mean that opening scene at the orphanage it just had that Oliver Twist feel with Peter going up for his porridge. It was the sort of clichéd scene you'd expect in an orphanage scene especially one set in Britain. Then there's the visual effects which at times look brilliant and then when it comes to scenes of Peter flying looked like the used the models that showed up on Polar Express (2004). The only thing that was consistent was the production designs for the sets and costume, those were beautifully done and colorful but then on close-up scenes they looked like stage sets for a play. Didn't look all that convincing. Also why does Neverland a magical place that used to have fairies have Zombie Birds with colorful plumage? That just seemed a little odd and out of place. And a little too cartoony. Finally the music and score. Not too sure where they were going with it. At times it felt like they were scoring a musical and then the next not so much. In the scene where the miners sing in unison Nirvana's Smells Like Teen Spirit not only did I think that song was an unusual choice but when Blackbeard showed up in his flamboyant outfit full of feathers I half expected him to break into song and dance when he too began to sing. It was very uneven. Honestly this film to me is a bit of a mess from a lot of angles and because of that I couldn't really enjoy it much. I was so hoping to have fun but couldn't this movie falls short in so many ways. Or maybe it's just me. If you're like me you're probably going to feel the same. This movie looks and feels to me to be purely for the younger crowd which seems sort of odd when there are scenes of kids being dropped kicked off a plank to fall to their deaths, scenes of pirates being tossed overboard by fairies also to fall to their death and of course shooting Picanninnies who then explode into colorful clouds. Not too sure what the message is or what it'll say to kids. The only reason to watch this film is that you're really curious or you're a fan of Hugh Jackman other than that there's little reason. Maybe go for the special effects because at times it is fun to watch but other than that I can't really recommend this if you're an adult and looking for a polished piece of cinema. Or even those who are looking for a film that isn't too predictable or too clichéd. But I guess if you have kids it would be fun to take them as it is colorful and the story is simple as is the dialogue. And I think kids will be more willing to accept the at times exaggerated performance of the actors better too especially Garrett Hedlund's. His performance was exaggerated to the point of being cartoony. 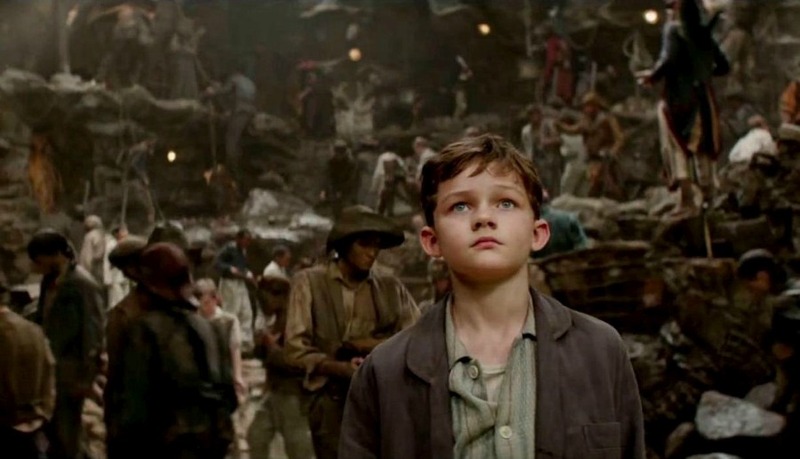 Here's the trailer and see if you can spot what I was talking about when it comes to Levi Miller. I'D LIKE TO THANK BUDIEY AND WARNER BROS MALAYSIA FOR THE #PREMIEREWITHBUDIEY PASSES TO PAN! AND THANK YOU TGV CINEMAS @ 1 UTAMA FOR HOSTING THE PREVIEW SCREENING!